We didn't believe it at first. We had to go to Wikipedia to verify it, but it's true. This month marks the 30th yahrzeit of comedian Andy Kaufman, who for all the funny characters he portrayed, insisted on being known as a song-and-dance man. According to his Wikipedia biography, Kaufman "was a popular and eccentric American entertainer, actor and performance artist." "Elaborate ruses and pranks were major elements of his career. His body of work maintains a cult following and he continues to be respected for his original material, performance style, and unflinching commitment to character." Kaufman came to prominence with his "Mighty Mouse" routine on the first Saturday Night Live show. He portrayed a garage mechanic from an unidentified European country on the sitcom Taxi, which also starred Danny DeVito and Jewish actors Judd Hirsch (Alex) and Carol Kane (Simka) and featured Dr. Joyce Brothers as herself in this episode. 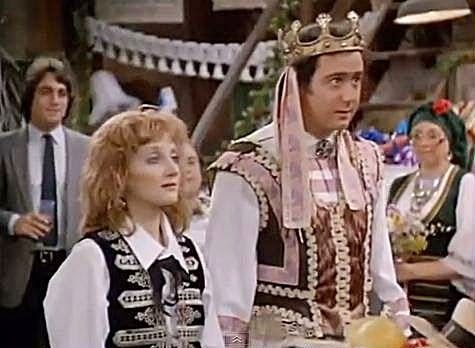 The character he played on Taxi, Latka Gravas, had a Jewish and Eastern European feel to it even though it was never specific. The dialect, language and rituals were all made up, but whatever your ethnicity, they made it seem that they captured some of the flavor of the "old country", whatever it was. Kaufman was born in New York City and grew up in a middle-class Jewish family in Great Neck, Long Island. He died at the age of 35 from a rare form of lung cancer. For years his fans thought he was faking his death as another elaborate prank.